European shares and futures on the , and tracked Asian stocks higher, after U.S. President Donald Trump delayed the dreaded March 1 tariff deadline on Chinese exports. China’s state-run Xinhua news agency, however, later warned against possible new uncertainties in the final stage of U.S.-china diplomatic talks. The opened with a 0.18% gap higher, extended the rally to 0.53% but then buckled, paring the advance to 0.27% at the time of writing. Were prices to close at these levels, they would have formed a shooting star and a potential Evening Star, in Japanese Candlestick methodology, or an Island Reversal, in Western technical analysis. Carmakers and materials, the biggest beneficiaries of trade breakthroughs, jumped 1.1%. Banks shares also enjoyed some upbeat gains. Earlier, during the Asian session, most regional indices rallied across the board, after reports broke of a U.S. tariffs deadline extension. China’s surged 5.6%, the biggest leap in three years, to the highest close since July 15. The price jump was just enough to push the index back into bull market territory, gaining 20.18% since 2018’s bottom. Hong Kong’s , conversely, only ticked 0.5% higher, developing a high-wave doji, as institutional investors remained cautious ahead of earnings releases, in a sign that smart money in the region isn’t easily convinced that global dynamics are really shifting. This posture begs the question: what will happen to Chinese shares—and indeed global stocks—if there is no substantial trade agreement? Friday saw a broad equity rally help the , and the seal a ninth consecutive weekly advance and the clinch a fourth straight week of gains. 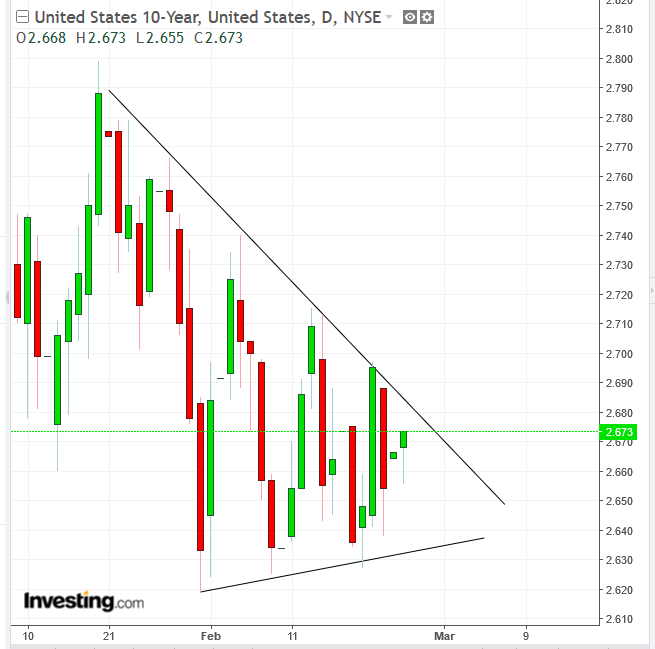 In bond trading, although the yield on Treasurys is climbing on risk-on today, it is still within its range since January, with an obvious downward bias. Should the 2.6% level be broken, we could expect yields to retest December lows—an omen for stocks, which hold a direct relationship with yields. 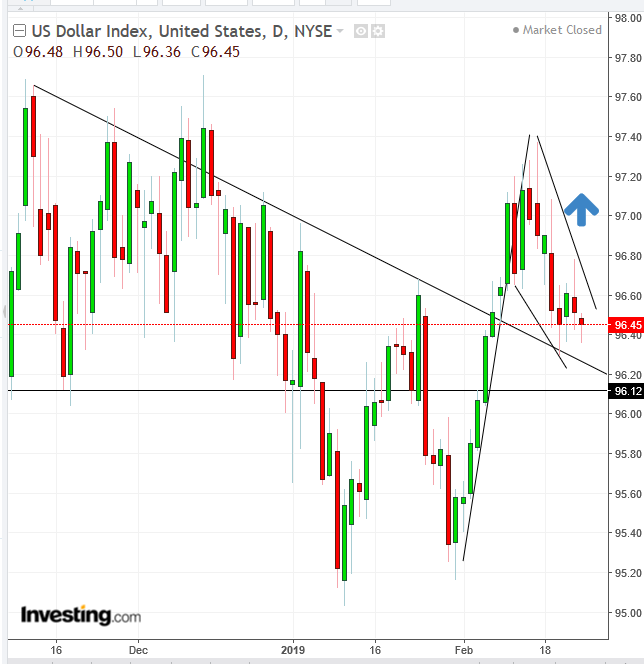 The slipped alongside Treasurys, but was still held up by the support of the broken downtrend line since mid November and the 96.00 level—the November-December double-top neckline. Fed Chairman Jerome Powell delivers on monetary policy and the state of the economy to House and Senate committees today and tomorrow. U.K. Prime Minister Theresa May delayed a ‘meaningful vote’ on Brexit to before March 12, sparking speculations around a delay on the March 29 final deadline. U.S. President Donald Trump and North Korea leader Kim Jong Un are expected to meet for a second summit beginning on Tuesday. Macy’s (NYSE:) reports before market open on Tuesday, with forecasts of $2.53 EPS and $2.44 billion revenues. Forward guidance for 2019 will be closely watched after the company cut its full-year earnings expectations last mont, sending the stock further lower. figures come out on Thursday. Canadian and are released Wednesday. Canadian and for January are released Thursday. Canadian for December and are released Friday. The gained 0.3 percent, reaching the highest in more than 10 weeks on its sixth straight advance. slipped 0.2 percent to $67.00 a barrel, the largest fall in two weeks. LME rose 0.8 percent to $6,531.00 per metric ton, the highest in eight months. climbed less than 0.05 percent to $1,329.69 an ounce. The yellow metal could lose some of its safe-haven spark if trade negotiations yield a substantial deal.